It’s scheduled from 10th-14th November 2014, so keep that in your calendars! Want to follow our events online? 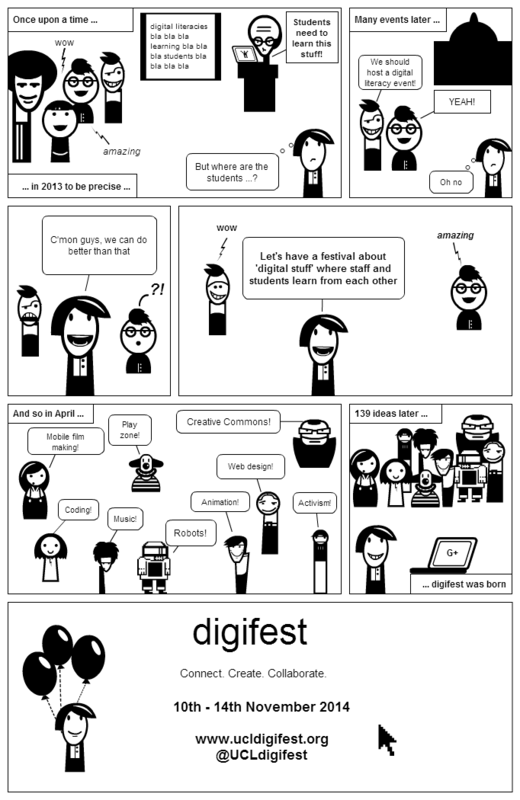 Join us on Twitter: @ucldigifest and hashtag #UCLdigifest! We are also on Facebook – check out all our events here. Sign up to our newsletter to keep up to date with how our festival is growing! We are a group of UCL staff and students who want this digifest to be a fun hands-on festival of “digital things”, using a variety of digital tools and innovative ways to share and learn things in new ways. These panels, interactive workshops and games we have planned are things that excite us about the future of digital technology and we want everyone else to see why! A festival of all digital things, coming to you soon.